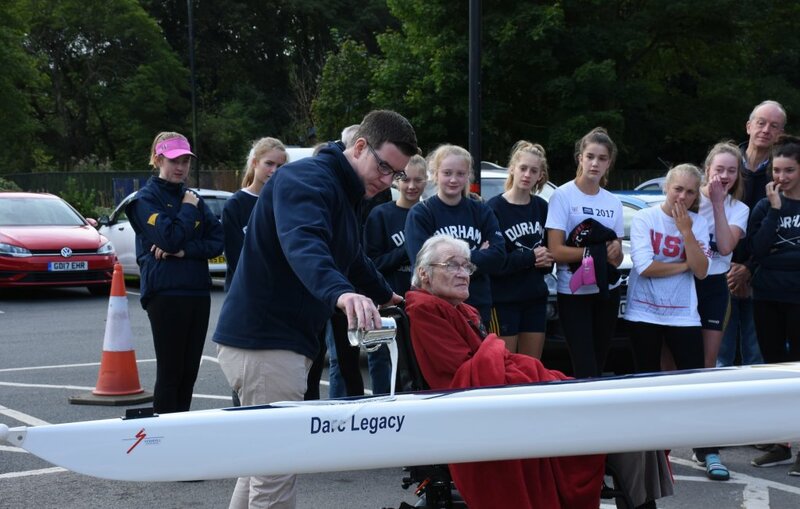 Around 120 members of the Junior, Senior and Masters squads gathered on Sunday September 16th for the naming of the club’s three new boats, a Stampfli quad ‘Darc Side of the Moon’ and double ‘Darc Legacy’, and a Janousek quad ‘Great White Darc’, whose purchase has been funded in part from the bequest of former long-standing member and Club Captain Kim Metcalfe who died in 2013. Kim rowed for the club during the 1960s and 70s, and formed a successful partnership with John Appleby in the pair, before going on to success in veteran and masters competition, winning at the World Masters Championships at Strathclyde Park in 1988 and again in 2005, and winning several national masters titles in the pair, four and eight. He was also an outstanding ambassador for the club as a coach and was an advocate of the Explore Rowing movement introduced by British Rowing in 2010 to integrate new recruits into the sport. Kim’s son Alex and brother Phil Metcalfe had the honour of naming Darc Legacy, while Great White Darc was named by last year’s Junior Captain Harry Coe, and Darc Side of the Moon by Women’s Vice-Captain Alison Danforth, watched by a delighted Captain George Adair, who explained ‘Kim Metcalfe had a massive influence on the membership. 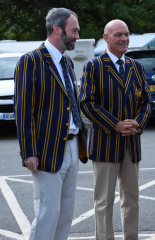 He was an excellent oarsman but also a great coach and one who could offer advice and guidance in an approachable way. He would work with every section of the club so the legacy was partly monetary but mainly his effect in general around the club and the legacy he left behind in memories and advice’. A row past by the three boats followed, with crews selected to represent the diversity of the membership. Recent graduates from the club’s Learn to Row courses as well as more experienced members will benefit from the new boats. DARC Legacy was crewed by John Appleby and Hazel Stainforth, members of the masters squad which competes nationally and internationally. 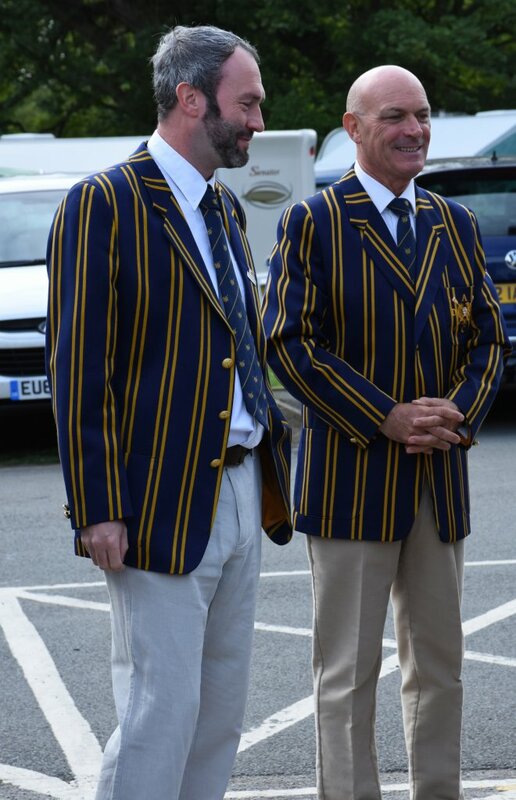 Both are long-standing members of the club and great representatives of the DARC spirit. John has competed for DARC for over 50 years, achieving one of his 3 Grand Challenge Cup successes at Durham Regatta in 1969 whilst a member of the club, and as well as much success rowing in crews with Kim at national and international levels has partnered Hazel in a mixed double at World Masters Championships, winning at Strathclyde Park in 2005. Hazel took up rowing later in life after following her daughter Rebekah into the sport, winning the first of several national veterans titles in 2001, and after earning victories in a single scull at World Masters Championships went on to partner Rebekah to World Masters success in the Women’s Masters C double sculls at Zagreb, Croatia in 2007, becoming the first mother and daughter combination to win gold medals at that level. 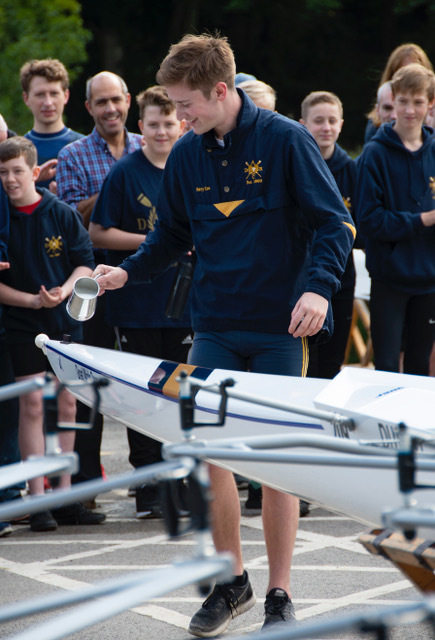 Members of the club’s successful Juniors squad made up the crew for ‘Great White DARC’, Ella Sampson, Adam Morris, Katie Strangward and Sam Taylor representing the J15, J16, J17 and J18 year groups who have had a successful year including competing at national Junior Championships and winning at Durham Regatta, while ‘DARC Side of the Moon’ was crewed by Gabrielle Maxfield, Alison Danforth, Vickie Sincock and Beth Holmes, a crew representing the Women’s squad, including those who joined from Learn to Row courses, from Durham University colleges, and from school/junior rowing to become performance rowers. ‘Beth and Alison have been with the squad for many years while Gabrielle and Vickie are new to the squad and have great races ahead of them’ said Alison. The acquisition of the new boats marks a major addition to the fleet prior to the commencement of a project to refurbish the boathouse, and comes in time for use during the autumn heads season which gets underway on October 6th with the Tyne ARC round of the Long Distance Sculling Series and Tyne United Small Boats Head. This entry was posted in Club News on September 26, 2018 by Colin Lawson.